We left Franz Josef after our bath. 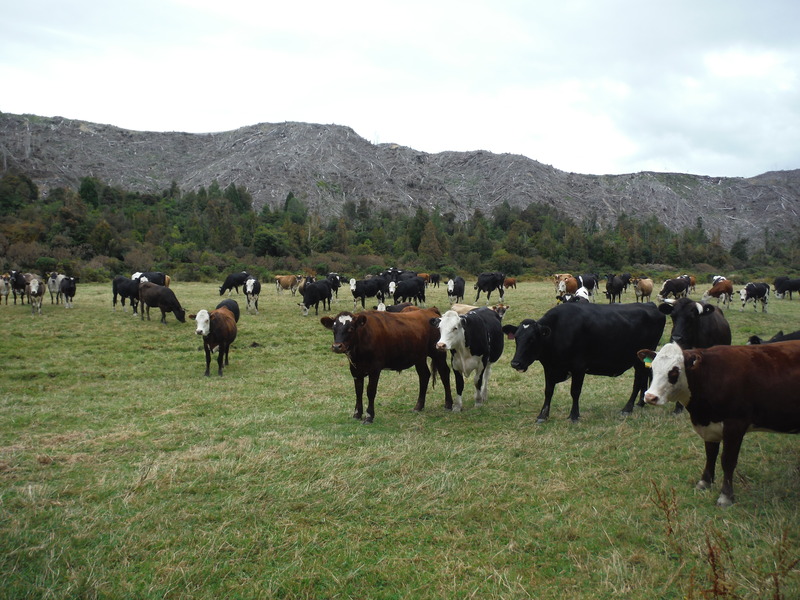 We had an appointment the following afternoon in the town of Greymouth, over 170km away. Nobody was keen on being the group who rocked up late. 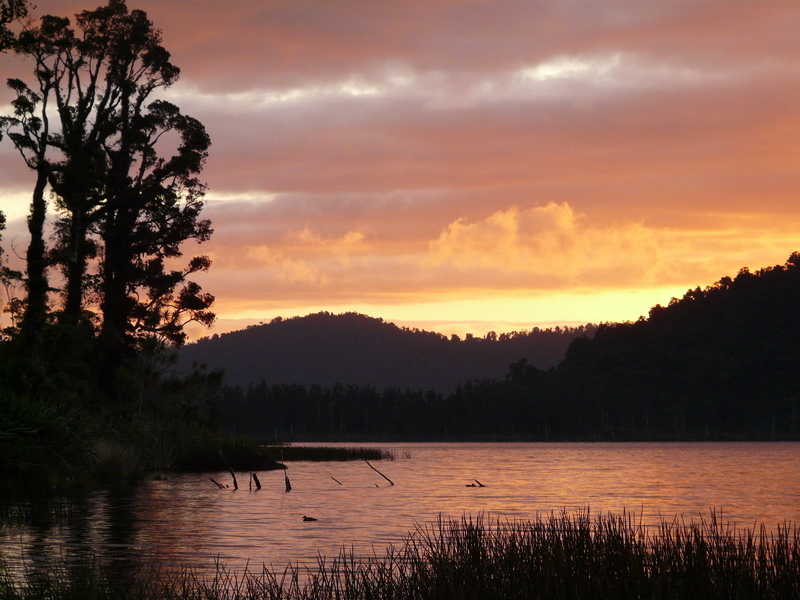 We spent the night on the shores of Lake Ianthe on the route and witnessed our first almost uninterrupted sunset. There were only a few low hills between us and the coast at this time. Greymouth doesn’t offer much in the guidebooks. When we arrived, we had plenty of time to spare. Taking a stroll through town struck us as the best idea. Monteith’s brewery lives here, if we had time I suggested it might be a good spot for dinner. 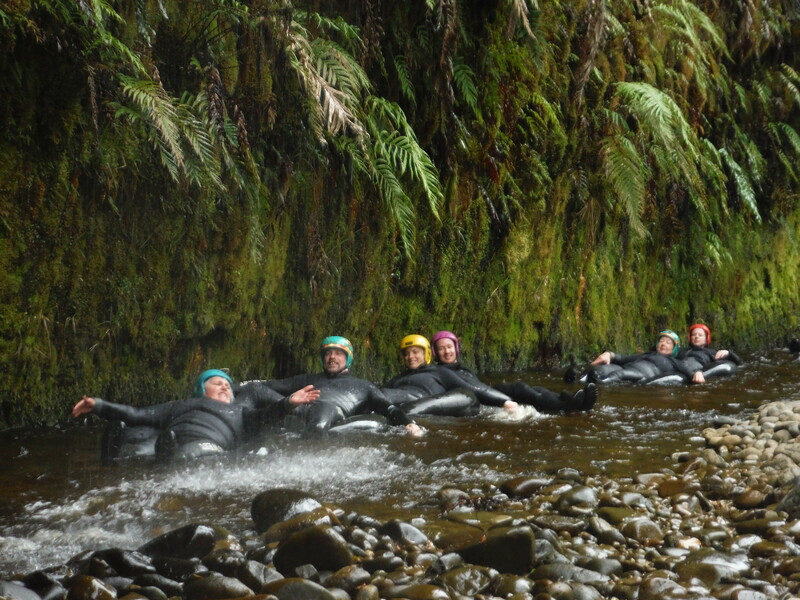 New Zealand is home of the adrenalin junkies! Extreme sports! Woo! 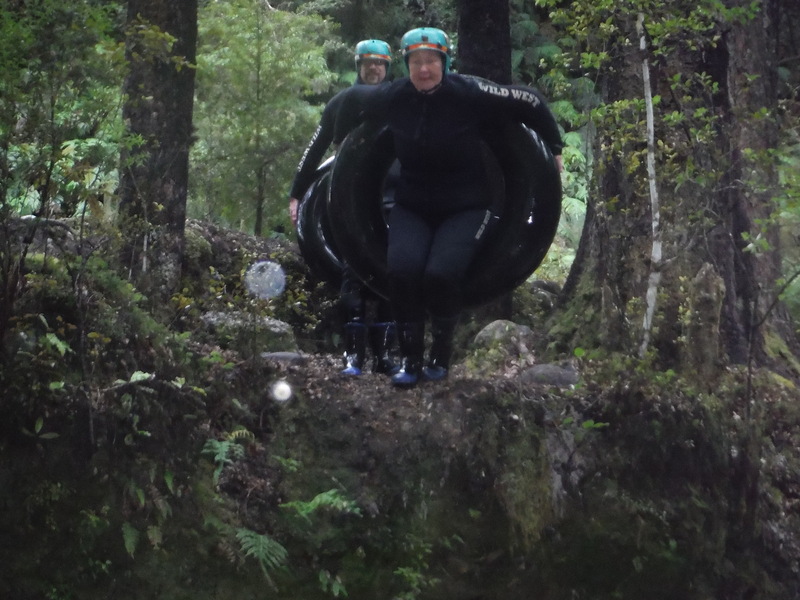 Lisa had booked us in to do some black water rafting through New Zealand Discovery Adventures. Black water sounded a more dangerous than white water. I’d been informed the major difference is between black and white water is that black happens in caves. Then she told me we’d start of by zip lining into the cave! 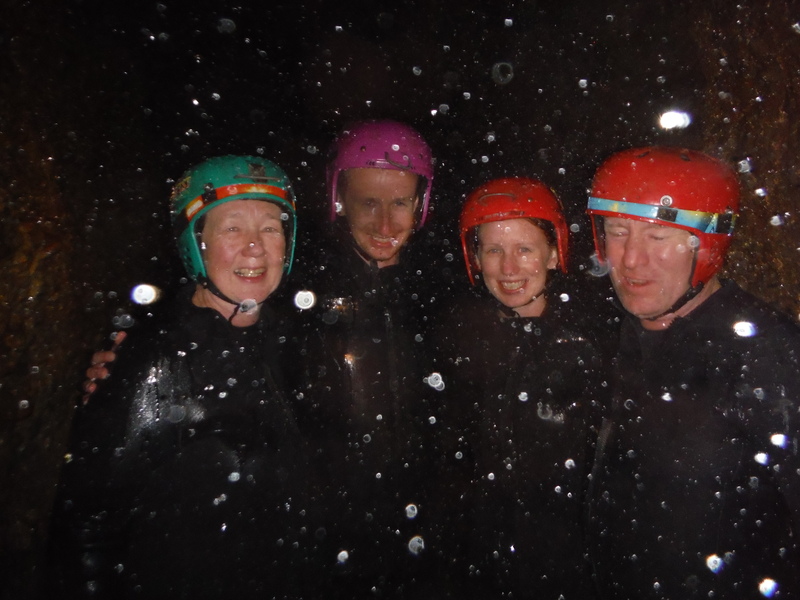 We were kitted out with thermals, wetsuits and harnesses. We collected helmets. 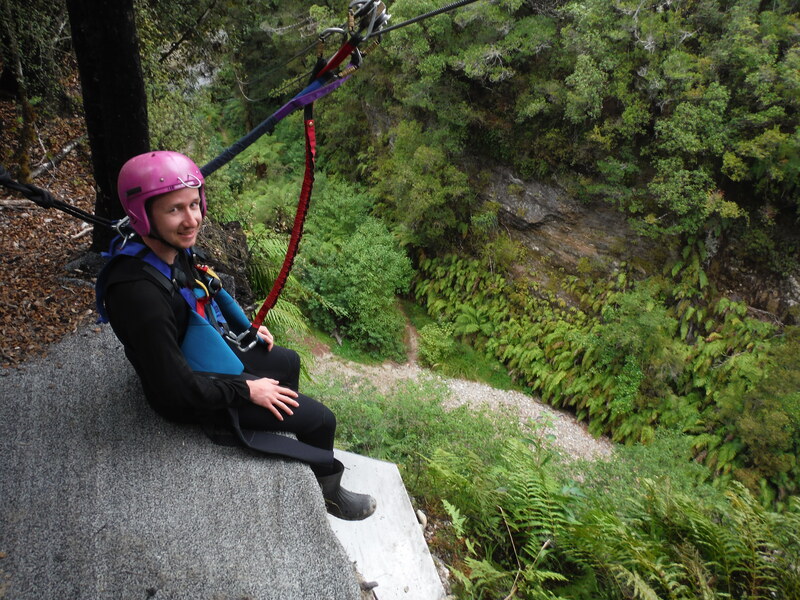 One of our guides, Jayjay passed me a pink helmet, expecting me to kick up a fuss. You give a man a pink helmet, the man wears the pink helmet with pride. Our group piled into a white van that smelled of wet dog. 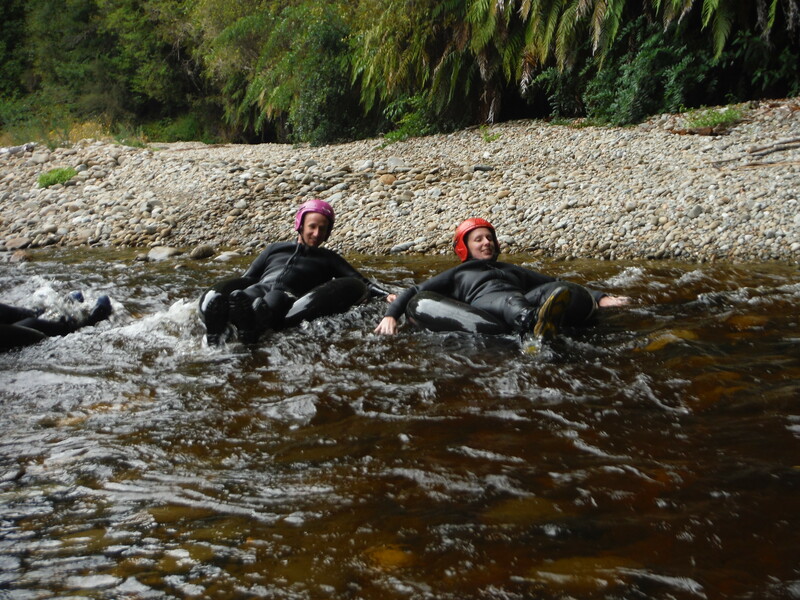 We drove some way out of Greymouth to a place called Nelson’s creek. 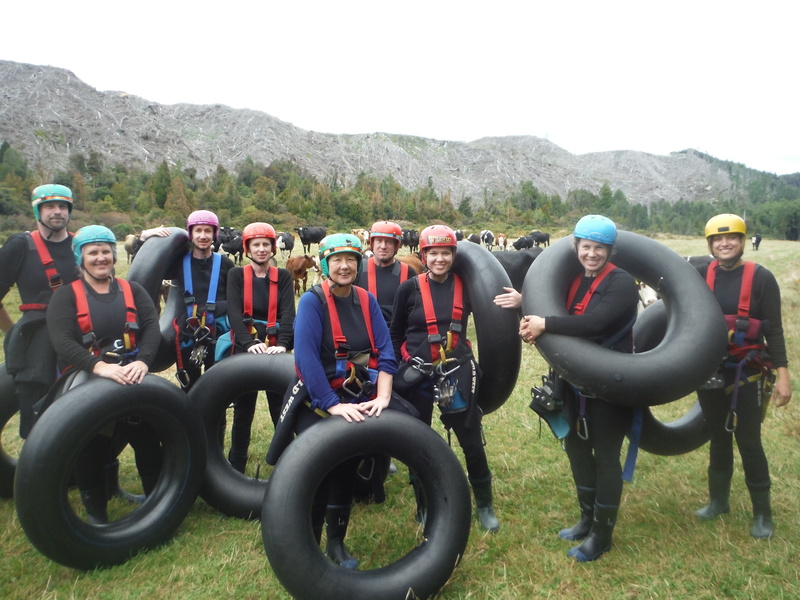 We collected a giant inner tube each and walked through a field of cows to begin our adventure. Our other guide, Pete, strapped us into a pen on the edge of a cliff, we began to feel remarkably like those cows. Straps, carabenas, pulleys were tightened, fastened, yanked and pulled. One by one we were led to the edge. The valley floor is 25 meters down. Pete cast the inner tubes off the edge, to give us an idea of how long it might take to hit the bottom. Gentle thumps greeted us as they made their landing. I didn’t doubt that we would fall faster and hit the ground with more force. My legs dangled over the cliff edge. My harness was securely attached to a steel cable, so I hoped. All I had to do was push off and let gravity take me down to the landing platform below. Easy, right? My fear of heights didn’t kick in, neither did my fear of dropping 25 meters to my death. I pushed off and flew through the air. I reached the bottom in seconds. Jayjay assisted with the final dismount and I was freed from my harness. Once everyone had reached the valley floor it was time to get wet. Jayjay would be coming with us on our adventure downstream. He instructed us on how to use the rubber rings. Sit in it. Paddle. Fall out if necessary. He tested our ability to stand up and sit down before he was happy for us to proceed. We floated on, keeping to the deepest part of the creek to avoid running aground in the rocky shallows. The cliff wall that we had launched from rose up on my right, it looked like one of those giant hanging gardens you sometimes get in fancy office foyers. Mosses and ferns draped over the brown clay, rain water dropped and dribbled through. The creek shallowed, sped up. 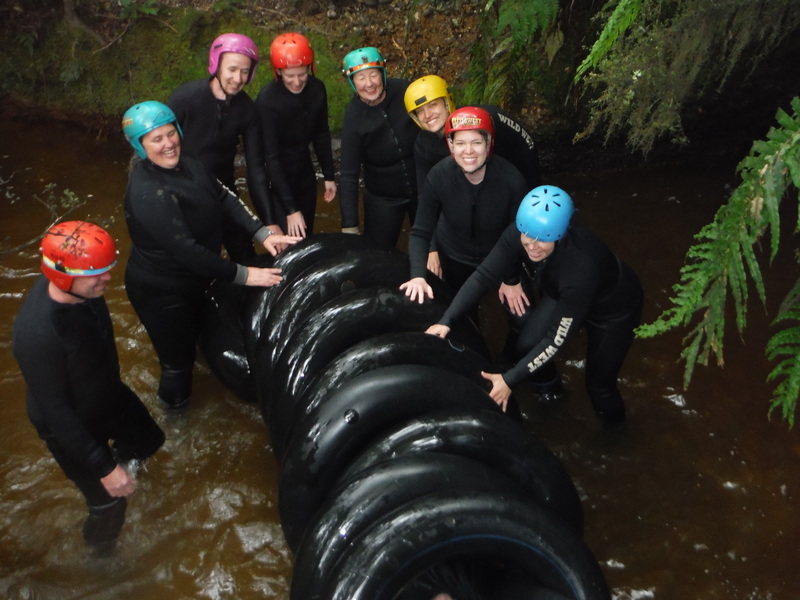 The easiest way to pass was to lean back as far as possible to keep the rubber ring as high in the water. I placed my hands behind my head, gazed skywards and enjoyed the gentle rocking motions of the creek. The only downside was the icy water that dripped down my neck when I sat up. Jayjay stopped us periodically so that we could learn some skills that we’d need for the journey’s end. We practised a running jump first. The simple procedure of running into the water, jumping and landing in your ring. Lisa took to it like a toddler learning how to walk, unaware of the basic principles of gravity. She ran and fell face first into the stream. I don’t think she managed to get both feet of the ground at the same time. A sensational example of how not to do it. The second stage was a standing jump. Starting from a standing position on a rock, we had to jump out away from the rock and land on our ring in the water. This was a much harder trick to learn. It’s one thing to run and jump into a ring, but to bring it down from behind to underneath you was a bigger challenge. Most of us discovered just how deep the creek was on this particular corner. Dad seemed to let go of his ring mid jump and landed entirely without it. Just around the river bend we stopped to exit the water. Here was an activity of a slightly different nature. We were to ride plastic sheets down a smooth ramp into the waters below. Once everyone had bounced over the ground before plunging into the icy waters, Jayjay threw the rings down to us. The tallest member of our group, Malcolm, managed to catch all of the rings around his body. He was declared human ring toss champion of the world. We had come down here to enter a cave and take in the next section of the experience. We walked in single file, pushing our rings in front of us. As we proceeded further underground, the darker our world became. It wasn’t long before there was the splash of somebody losing their footing. Mum had gone over in front of me. She was too busy looking up at the ceiling to notice the rock that caught her foot. She was back on her feet in no time, no damage done. Day had become night. Thousands of stars had emerged in the cave roof. Glow worms. We might have been walking down a narrow gorge at night, the only light guiding us that of the stars. There were galaxies of glow worms above our heads. We stopped next to an underground waterfall to have a cup of warming Milo and a Mars bar. I leaned back in my ring, admired the blue glow of the worms. Daylight grew stronger as we returned to the cave mouth. It was time for the grand finale of our journey downstream. This was what we had been warming up to with our practise jumps. Now, I’m not a massive fan of throwing myself off edges. It was all well and good when I was attached to a steel cable but I was now being asked to jump of a three meter tall cliff in the name of fun. I would have been more confident about it if it was a standard jump. No problem at all. We had to jump and land on our rings. We have already established just how tricky this manoeuvre can be. Still, you can hardly come all this way and not commit to see the journey through! You can’t keep the fear out of your face when you jump. It’s equally difficult to get your ring into position. There’s no time to think. I hit the water hard. I felt like somebody had tried to tear me in half. I had the ring. I’d landed on it and bounced. Then it was over. We were back on dry land, back in the van which now, with our added damp smells, was even more unpleasant. We finished up in a warming hot tub with a drink and a muffin. 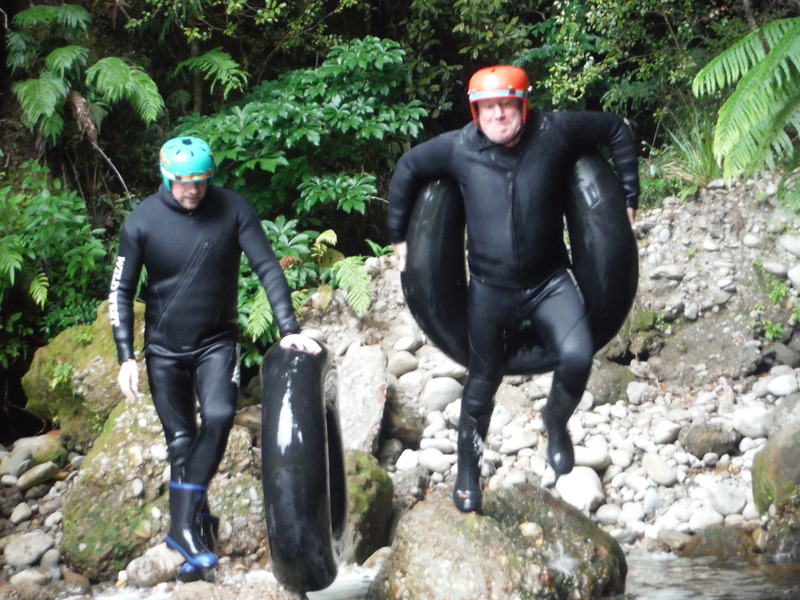 It wasn’t the adrenalin filled experience we’d signed up for, but the gentle motions of floating down the river was greatly appreciated by all of us. There were no complaints about the lack of intensity, or extreme elements of our mini-adventure. We finished the day with fish and chips and drove down to the coast to a beachside campsite. After a couple of packed days, I think we were all looking forward to being able to take it easy for a day or two. We settled in for the evening. 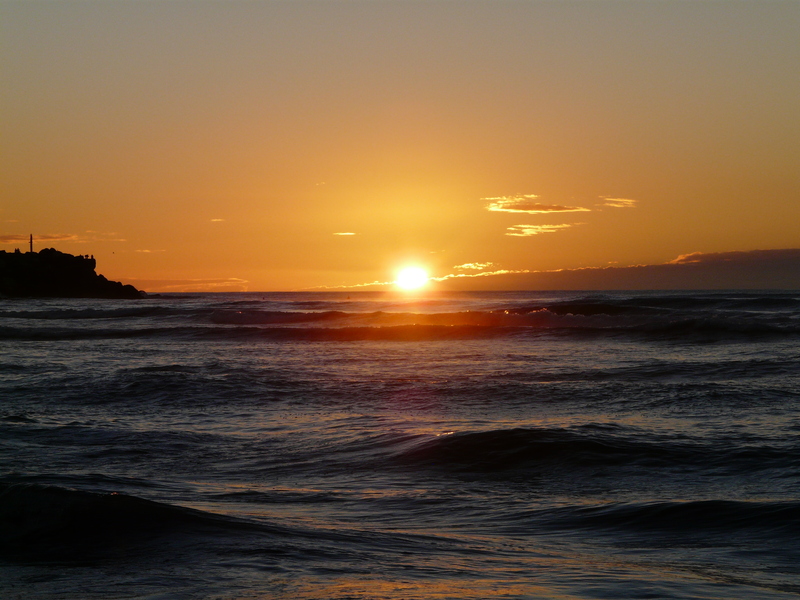 Without any obstructions beyond the Tasman sea we witnessed our second spectacular sunset in the same number of days. Not a bad way to end the day! No doubt about the Land of The Long White Cloud. It’s an adventurer’s paradise. Loved the images you added. Great content.